Marvel dropped a thermal detonator of an announcement at today’s Cup o’ Joe panel, revealing three new Star Wars comics helmed by all-star creative teams: Star Wars, an ongoing series by Jason Aaron and John Cassaday (coming January 2015); Star Wars: Darth Vader, an ongoing series by Kieron Gillen and Salvador Larroca (coming February 2015); and Star Wars: Princess Leia, a five-issue miniseries by Mark Waid and Terry Dodson (coming March 2015). All canonical within the Star Wars universe, each book will pick up where Star Wars: Episode IV A New Hope left off, filling in important, previously unexplored gaps for some of the saga’s most iconic characters. To put it simply, this is very big news. 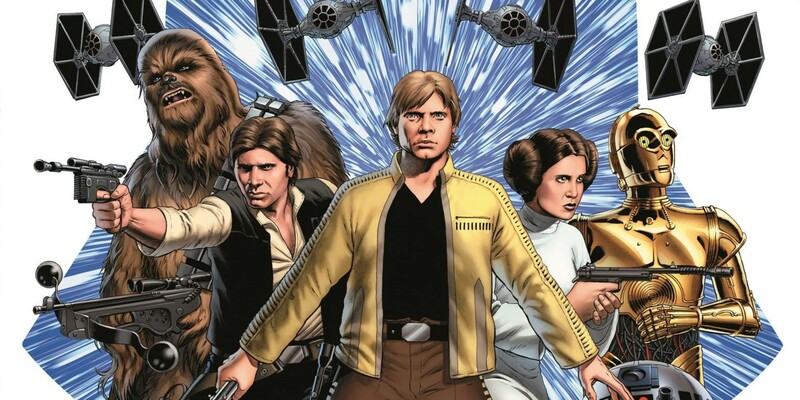 StarWars.com spoke with Aaron, Gillen, and Waid — the writers of each title — to find out what readers can expect from these historic comics. Jason Aaron comes to Star Wars having completed an incredible run of both critical and commercial hits, including memorable work on Marvel’s Wolverine, Wolverine and the X-Men, and the current event series Original Sin, as well his creator-owned title, Scalped. 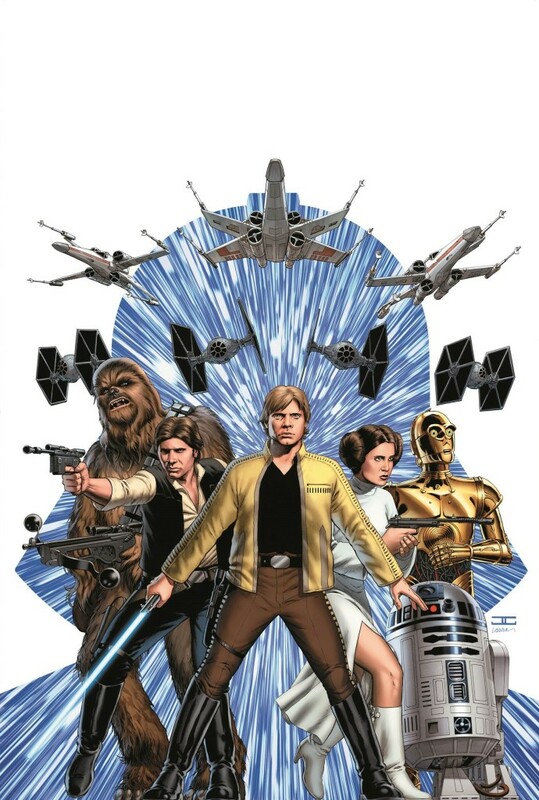 Star Wars #1 by Jason Aaron and John Cassaday. 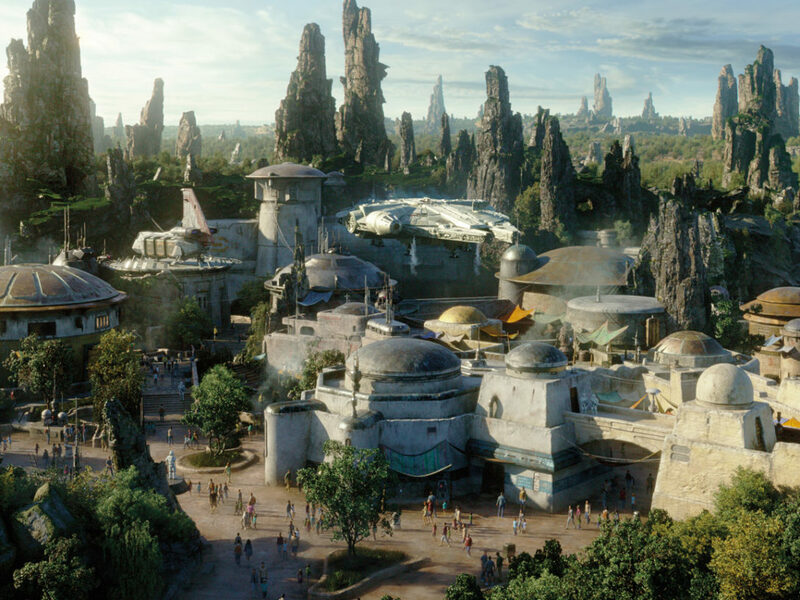 StarWars.com: To start off, I just wanted to ask: How excited are you? Jason Aaron: It feels great so far. We’ve been working on it for awhile now. It feels good now to finally be able to talk about it. The whole thing has been exciting. StarWars.com: How exactly did you get paired with this particular title? 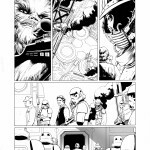 Jason Aaron: Axel Alonso, the [Marvel] editor in chief, called me up one day and said, “Star Wars,” and I said, “I’m in.” [Laughs] There was not much more to it. That was not long after everybody realized the Star Wars comics were going to be transitioning over to Marvel. It was a very simple conversation. I didn’t really need to think about it. It kind of threw my schedule for the year into chaos and that’s why I had to shuffle some things around. That’s why I had to leave the X-Men book I was doing, but I never gave it a second thought. It was the kind of job you couldn’t say no to. StarWars.com: Can you talk about Star Wars‘ impact or influence on you? 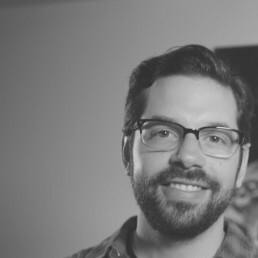 Jason Aaron: I can’t remember when I first saw Episode IV. I do remember seeing Empire Strikes Back very clearly in the theater. My mom took me and one of my friends, and my friend’s older brother. And the older brother had already seen it, so he kept wanting to tell us everything that was going to happen. “Oh, this part is going to be great. He’s going to cut the tauntaun open and stick Luke in there. This is awesome, just wait.” So we had to tell him to shut the hell up. StarWars.com: Good thing he didn’t have the Internet back then. Jason Aaron: [Laughs] Exactly. I still have my original Darth Vader action figure case packed with all my figures. So yeah, it was a huge part of my childhood, and as an adult, I never really thought much about being able to contribute to that universe. I feel very lucky that it kind of fell right into my lap. StarWars.com: I know you can’t talk about too many specifics, but what can we expect from your book? Jason Aaron: John Cassaday and I and everybody at Marvel have been on the same page since the get-go. We wanted this to feel like the movies. We wanted to feel like we were hired to do the direct sequel to the original film. So in terms of look, feel, and tone, that’s what we’re shooting for. It’s very much a team book and we’ve got all the main players here. Luke, Han, Leia, Chewie, the droids, and Darth Vader all get big moments in this first arc, and that’s our core cast going forward. I do want to be able to use Obi-Wan Kenobi. I’ve always liked the old Ben Kenobi version of Obi-Wan, so we will see him in some capacity. Story wise, I think our book is driven in some big way by Luke and by the pretty interesting spot we find him in at this period in the timeline. You look at the gap between Episodes IV and V and there’s quite a bit that happens off screen that we get to explore. I’m really excited by the fact that Luke is in this position where he’s still a guy who’s just fresh off the farm. This is all pretty new to him. His world has changed completely. He had this mentor for five minutes who now is dead and leaves him with all these questions about his father, about his history, and where he goes from here, and what’s his role in the grand scheme of things. I think Luke already can see that clearly there’s something special about him. He was able to blow up the Death Star and do this amazing thing, but he has no idea where to go from here. He still has a ways to go before Ben whispers in his ear and says, “Hey, maybe you should see this guy Yoda.” So it’s an interesting time for Luke. He’s on this journey of discovery by himself, and he wants to find out more about his father. Meanwhile, Darth Vader’s chasing after him trying to find out who’s this guy that blew up the Death Star. I like the fact that they’re kind of chasing each other, without realizing the full implication of what they’re chasing. Luke’s chasing after his dad while running away from Vader. There’s a lot of cool big beats in that gap that we get to grab and lay down as part of the canon. StarWars.com: One of my favorite things you’ve written, both as a character and as a series, is Wolverine, and Han Solo is maybe the closest thing that Star Wars has to a Wolverine. So I’m really excited to see your take on Han. 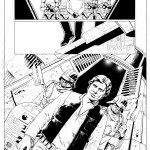 Jason Aaron: I think Han’s in an interesting spot at this point in the timeline, too. He’s hooked up with the Rebels in some capacity. I think it’s still a question mark for him at that point as to what is his role in this Rebellion and how much of a role does he want to have, and how long is he even going to stick around? I like the fact that he wakes up probably every morning thinking, “You know, today’s the day that I gotta get the hell out of here. This is not my fight, this is not who I am. I gotta go deal with my own stuff.” But clearly, for whatever reason, every morning he sticks around. So I like writing him in that position. We don’t know how fully committed he is to this Rebellion, and we’re in the very early stages of his relationship with Leia. That stuff is all cool. And of course, you know with Han, eventually his past is going to start catching up to him. So we’ll see that happen, and in new ways. Not just, “Hey, there’s a bounty hunter showing up to grab Han.” I think we’ve seen those stories before, so I want to something a little different. And I want to have some beats for Chewie too, beyond being just Han’s sidekick and co-pilot. We’ll get to see Chewie unleashed in cool ways, too, I think. StarWars.com: Since your book focuses on the bigger picture and doesn’t have a singular character focus, will we see characters from other parts of the saga? Possibly someone from the prequels or the later movies? Jason Aaron: Yeah, absolutely. I want to do as much of that as I can. You have to dance between the raindrops in some capacity, but absolutely. Even though, again, the core idea is to recreate the tone and feel of those original films, it doesn’t mean we have to be beholden to how we were introduced to those characters in the course of that timeline. So yeah, I want to dump the toys on the table and mix them up in some different ways. I think you’ll see Kieron doing that, as well, [with Star Wars: Darth Vader]. Whether that means characters you don’t meet until Empire or Jedi, or characters that we met in the prequels, or maybe some of the new stuff coming up, I think all of that can be in play. As long as it still feels true to that tone and that feel we’re going for. There’ll be new characters we bring in, as well. 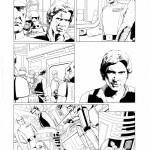 StarWars.com: Can you talk about working with John Cassaday on the book and what you think of his work so far? Jason Aaron: The book doesn’t start until January, but we’ve been working on it for a bit now, so there are scripts written and there are pages drawn and multiple covers. It’s moving right along. The stuff John’s doing looks awesome. I don’t know if you know just from John’s work quite how big a Star Wars fan he is. When we went out and did our meetings with Lucasfilm, we got to do a tour of the Ranch and we got to go to the Archives. You know, we’re looking at these shelves piled with lightsabers and blasters and spaceships. It’s pretty cool. But as we’re doing that, John was clearly the biggest Star Wars nerd out of all of us. [Laughs] He knew more about what we were looking at than I think anybody else. You could tell right away that this was something in his wheel house and something he was excited about. I think when you see the pages and the covers and everything, that passion is shining through. Of course, it’s no surprise that John Cassaday draws really well. I think we’ve seen that plenty of times before, but you may not know how passionate he is about Star Wars. 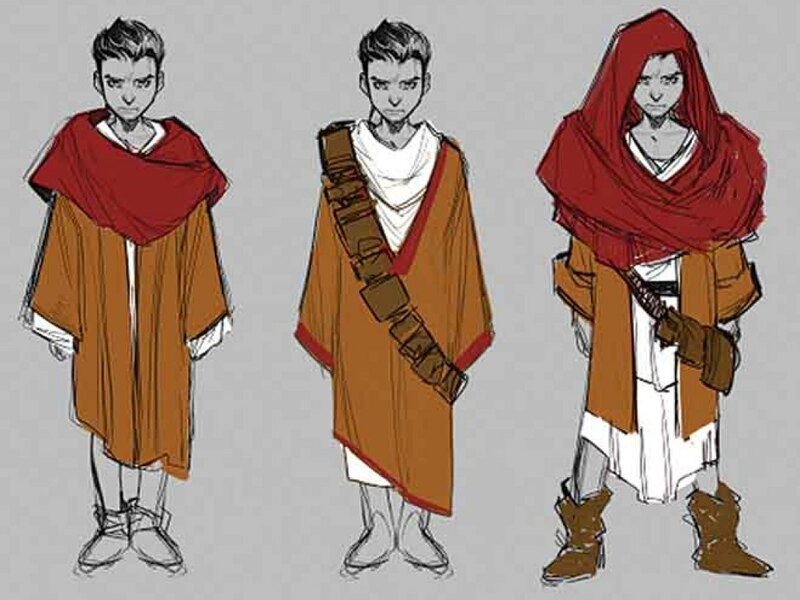 He already had character ideas about what Luke should be wearing and what Leia should be wearing. He already had a pretty clear vision for that from the earliest days of us talking. StarWars.com: Are you in alignment with Kieron Gillen and Mark Waid? Will things that happen in your book be mentioned or referenced in their books? Jason Aaron: Yeah. That’s kind of what we’re used to doing at Marvel. If you work in the X-Men office, there are several different X-Men titles that fit together. I think especially, the book Kieron is doing and my book will feel like two different sides of the same coin. You’ll see, from time to time, where the books come together and where they go apart. Vader, in my book, plays a very specific role. And then in Kieron’s book you get to kind of peek behind the curtain and see what it’s like on the Empire side of things. So, yeah, we’ll be working very closely with all that stuff. 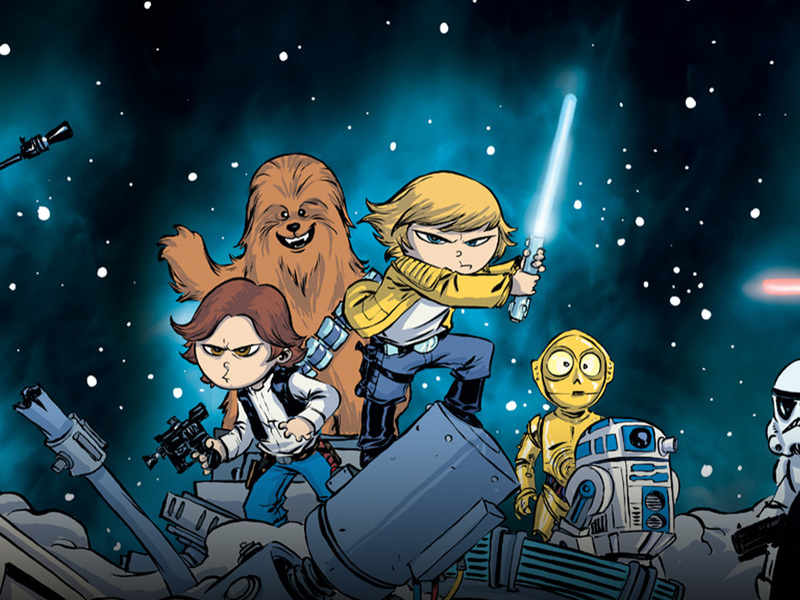 StarWars.com: Finally, these comics are in continuity with the overall saga. What does it mean to you to be writing Star Wars stories that count just as much as the movies do? Jason Aaron: That part’s kind of gravy. Of course, I didn’t really know anything about that when I took the job. I just said, “Sure, Star Wars comic, I’m down.” That certainly frees us all up to go back to the original source material. It was really refreshing when I sat down to say, “Well, what do I need to do, research-wise?” Well, I have to go watch one movie, that original film, and that’s all you need to know coming into this. [Laughs] Certainly, you take advantage of the fact that we know where the story is going and where it’s been, in terms of the other movies and everything else that’s part of the canon. But I found it really refreshing and freeing to go back to that original film and kind of remember what it was like to first see that movie and first get introduced to that world as a kid. I wanted to recapture that same sort of excitement and feel. That’s pretty much what we’re going for with this book. 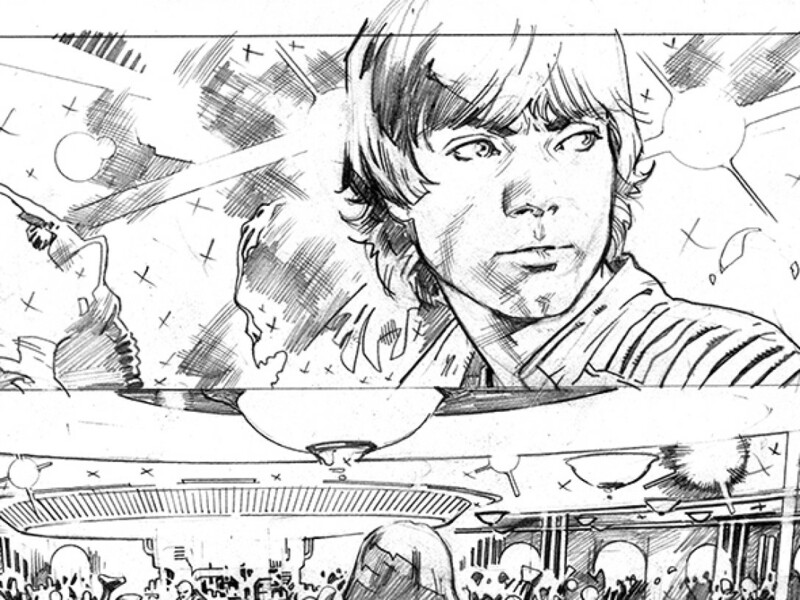 Enjoy these special preview pages from Star Wars #1. 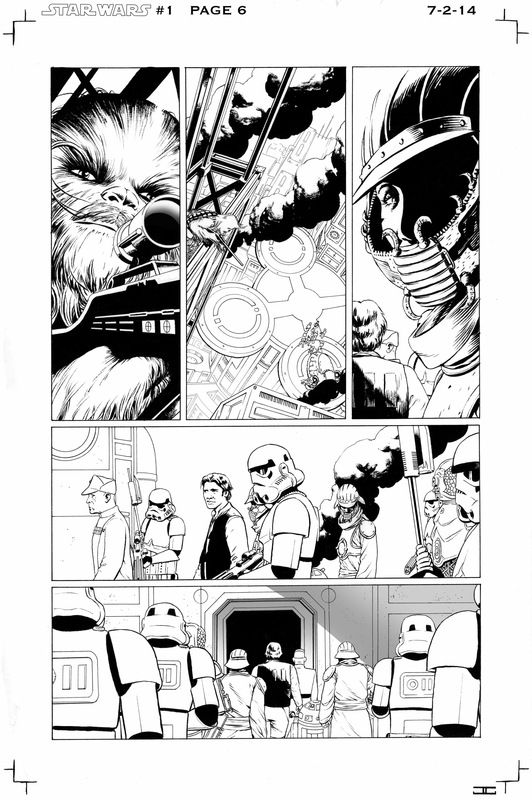 Star Wars #1, page 2. 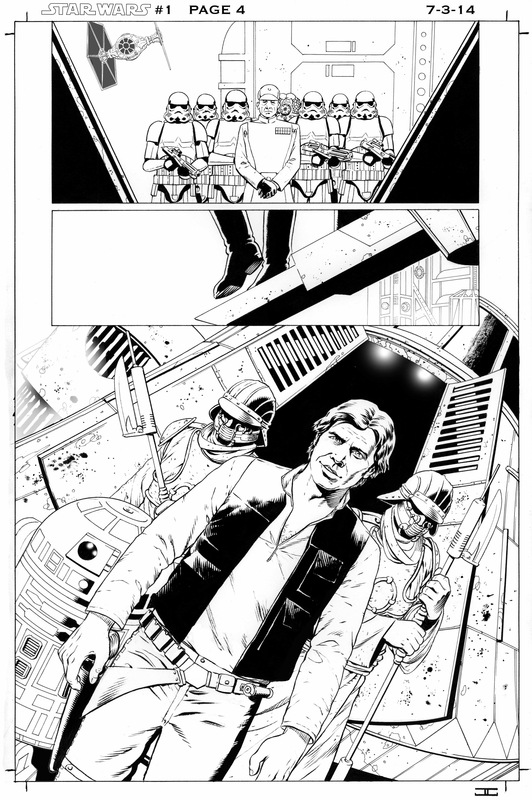 Star Wars #1, page 4. 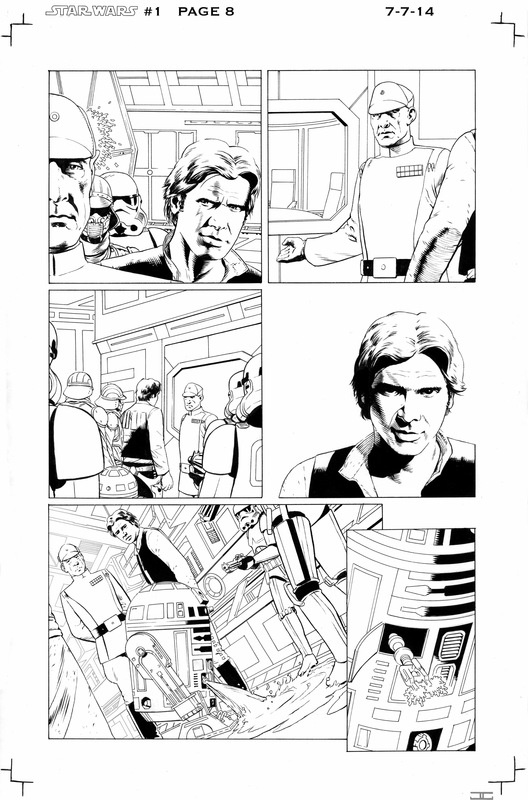 Star Wars #1, page 6. 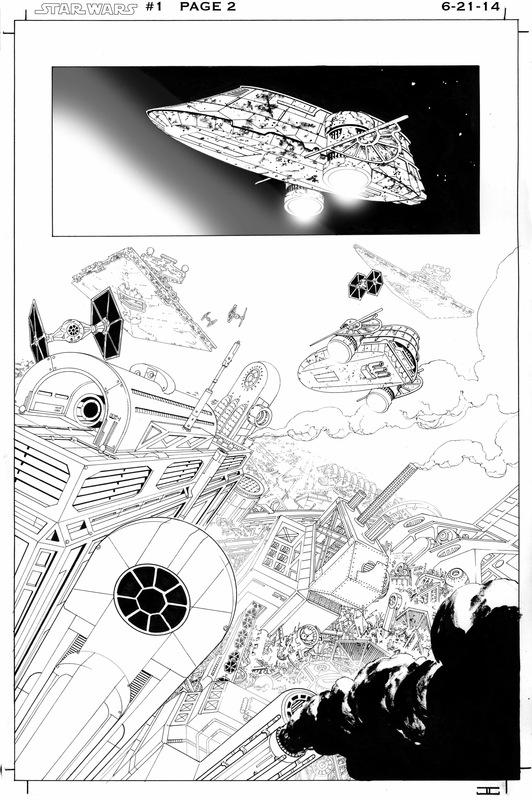 Star Wars #1, page 8. Kieron Gillen has quickly risen to become one of Marvel’s most in-demand writers, with popular stints on some of the publisher’s biggest titles including Thor, Uncanny X-Men, and Invincible Iron Man. Star Wars: Darth Vader #1 by Kieron Gillen and Salvador Larroca. StarWars.com: How excited are you to be writing this series? Kieron Gillen: It’s kind of like, I was so excited that I almost turned down the job originally. [Laughs] I was aware of the size of it, and I thought, “Well, maybe it’s better if someone else does it.” Then they told me about the fledgling idea of the book, and I thought, actually — wow, I’m about to be really egotistical [Laughs] — of all the guys at Marvel, I think I’m the most aligned to write the Darth Vader book. I’ve always been interested in how the antagonists and villains work, and what makes people bad, and all these kinds of things. It kind of just ties into so many things in my writing, and I’ve always wanted to do something based around villains, or something much more on the dark side — no pun intended. The idea of actually doing that with arguably the greatest villain in pop culture is [amazing]. StarWars.com: This is part of the new canon and continuity alignment. What does it mean to you to be writing stories included in that? Kieron Gillen: That’s the other big part of the thing. It’s not just like I’m writing Star Wars in some random, small thing. I’m going to be writing fundamental things with tremendous import, and they are in the canon. If you think about the period when we’re doing the book, after A New Hope and leading into Empire, that is such a phenomenally important time for all the characters. You just think about the genuinely fundamental things that we never got to see. We never see the moment where Darth realizes he actually has a son. That’s kind of the flip of the “I am your father” scene. We never really get to see Vader having that moment, you know what I mean? StarWars.com: Yes. It’s probably pretty surprising for him, as well. Kieron Gillen: Exactly. That’s going to be really powerful. I quite like playing for high stakes. 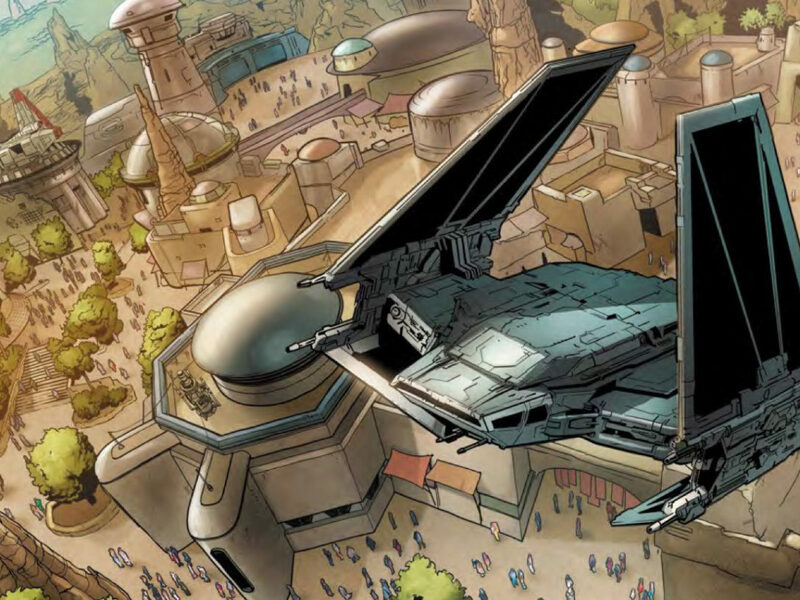 StarWars.com: Where do we find Vader in your comic? What’s the basic premise? The weird thing is, when you look at him at the start of Empire, he’s actually in a far more dominant position than he was at the end of Star Wars. StarWars.com: Right. In A New Hope, Tarkin is really his boss, in many ways. 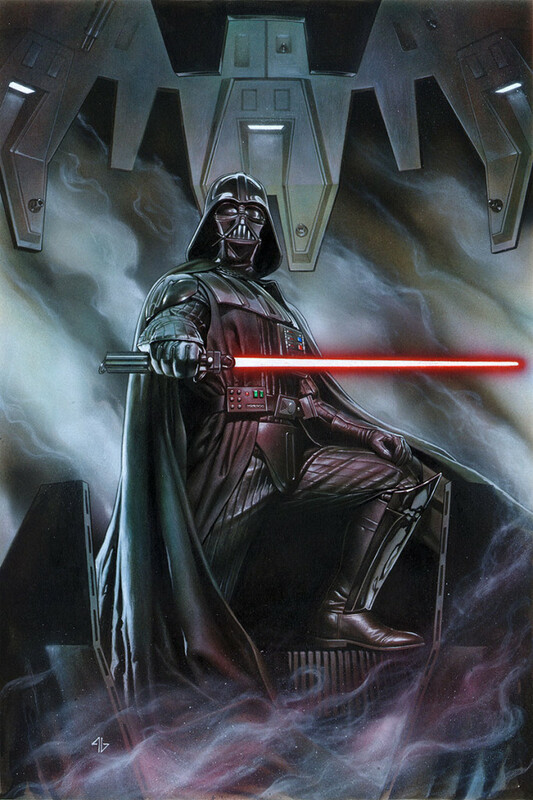 And in Empire, with Tarkin gone, Vader has a much greater level of control. So there was a change. Kieron Gillen: Exactly. He treats people with more contempt. He acts out more violently without being censored by any of his peers. Vader by that point is in a much more powerful position. That for me was the implied storyline — basically, the fall and rise of Darth Vader, and it leads into where we see him at the start of Empire. That’s a really good backbone for a story. If I’m not referencing Star Wars, because that’s our magnetic north, I reference House of Cards. It’s about somebody in a position of power who feels slighted, and then turns to tactics he may not have chosen before to achieve his aims and to rebuild his power structure. That’s kind of how the book works. In Jason’s book, Vader’s primarily the antagonist. He’s a force of nature they cannot seem to escape. In my book, that’s what he does on Tuesday. Vader has so many more responsibilities and problems to deal with than anyone could possibly understand. There are things that people above him may want him to do, versus what he actually needs to do to achieve his own aims, which is not the least bit to discover what the hell was going on with that mysterious fighter pilot who was strong with the Force. Vader has certain rivals in the story. There are spiritual versus materialist wings of the Empire. There’s that kind of internal fight; Vader’s very much a Force purist, and there are a lot of people that simply don’t believe in that old stupid religion. Then there’s a lot of stuff that touches on the underworld. When Vader’s reaching out to people to try to get stuff done, he can’t really do it in front of the Empire. One of the things I’ve always found fascinating is the bounty hunter briefing scene in Empire. It tells you two things. One, Vader really is a micro-manager. [Laughs] And two, he knows them. He specifically says, “No disintegrations,” [to Boba Fett]. He knows enough about this dude, and these dudes, to brief them in specific ways. So we’re digging into that relationship a little bit — how Vader knows this stuff. So, yeah, that’s the idea. It’s a story set inside the Empire, but a lot of the driving force is Vader’s own personal choices and the people he keeps around him to achieve his aims. The one problem with doing a book like this is it’s just kind of, Vader plus dudes in uniform plus stormtroopers. It’s very gray, you know? If you move the story into the underworld and [bring in] some of the more colorful characters, you get a much wider tone without undermining Vader. StarWars.com: With bounty hunters and the underworld, you can have shady characters, but they don’t necessarily have to be evil. There are different sides to them. StarWars.com: I’m wondering if your love of Star Wars from when you were younger has influenced how you’re approaching this, and have you done any new research in terms of going back and watching the films to see if you can learn something new? Kieron Gillen: Oh yeah, definitely. Empire was the first movie I ever saw in the cinema. It’s like Tolkien is to me. This is at the root of me as a writer of fantastical fiction. So I’m trying to reconnect with those emotions and work out, “Well, why did that move you? What was so interesting about it?” How can I try and create a similar emotion? I actually sat and watched the movies, taking quite ludicrously detailed notes on them, trying to subtext the scenes and discovering new ways of seeing. Minor stuff I find fascinating, like the Republic not being officially dissolved until the start of A New Hope. And the Emperor’s long-term plans — he spent 20 years building the Death Star. I think it’s fascinating that the Emperor’s plan of subjugating the universe is actually a very materialistic one. There’s all sorts of random, weird stuff I’ve picked up. It’s surprising, because I’ve seen the movie so many times over the years. But if you actually sit and really deconstruct with your writer’s brain, you can go to interesting places. StarWars.com: Is there anything you’d want Star Wars fans in particular to know about your series? Kieron Gillen: Yeah, I’m petrified. [Laughs] It feels like I’m a writing a very fundamental period for him. It’s almost like Vader has been living a lie for 20 years. He just simply hasn’t known something. The discovery of Luke and the discovery of everything else going on is such an important period of his life, maybe the most important period since his fall. 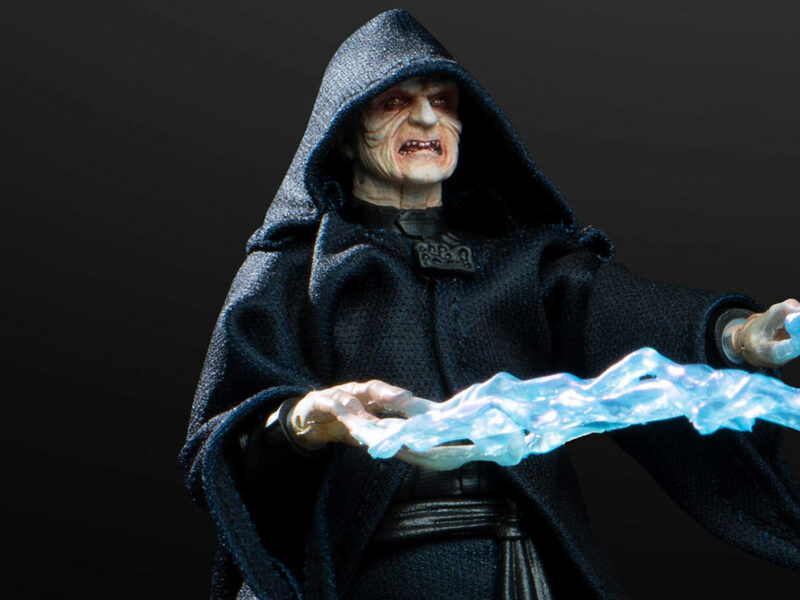 StarWars.com: At the end of Revenge of the Sith, there’s that scene where the Emperor tells Vader he killed Padmé. And Vader essentially knows, for the first time, that the Emperor is lying to him about something. His discovery of Luke confirms it. Kieron Gillen: Yeah. 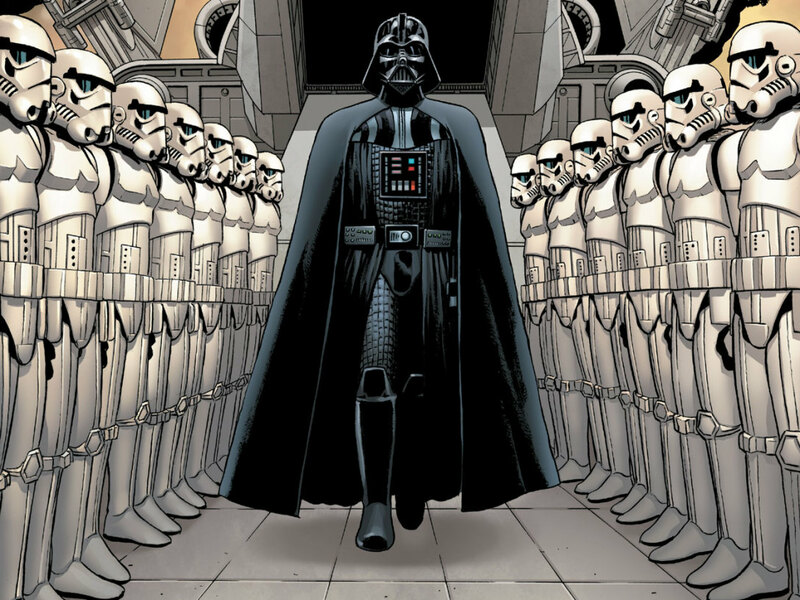 The push and pull between Vader and the Emperor is at the heart of the book. On some level Vader wants to prove himself to the Emperor, on another level he wants to depose him. That’s the way of the Sith. There’s really good personal drama. An industry legend, Mark Waid has penned several classics featuring some of comics’ greatest heroes, from Daredevil to Captain America to Superman. 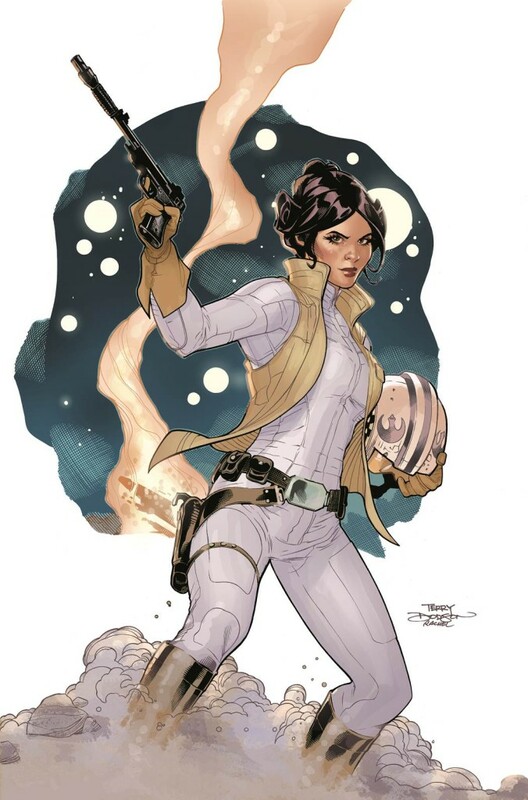 Star Wars: Princess Leia #1 by Mark Waid and Terry Dodson. StarWars.com: What did you think of Leia when you first saw her in the original Star Wars? Mark Waid: Oh, I loved her from the start because she was so unlike a lot of women in film of the day. She wasn’t a damsel in distress, she wasn’t a princess to be rescued from an ivory tower. That was the setup, and yet the payoff is, once you get her onscreen and she’s active in the story, she’s a badass. She’s the one teaching the boys how to use their toys. That was so unique at the time, and sadly, it’s still a little unique. So, that to me is the appeal of really being able to get in there and show what I love about that character and why there are things about that character that are still unique, in terms of her tone, in terms of the way she commands the story, in terms of her connection to the other characters. 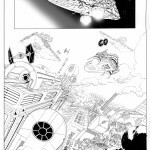 StarWars.com: I asked this to both Jason Aaron and Kieron Gillen: how excited are you? Mark Waid: I’m over the moon. I mean, I’m really very excited. Over the Marvel and DC universes, I’ve pretty much methodically made my way through all the iconic characters, so it’s really cool to have a whole new vista opened up for me. StarWars.com: That’s one thing I wanted to talk about. You’ve had a career where you’ve been able to write all of Marvel and DC’s icons and make your mark on them. Do you see this as a challenge for you to step into this new universe? Mark Waid: The thing is, after spending a career working on iconic characters, I look at it more as an opportunity than a challenge. I enjoy working in other people’s universes. I enjoy having parameters built out for you in terms of what the world is, and then my job becomes finding some sort of personal touchstone or emotional connection to one or more these characters that allows me to tell a story I want to tell. The important thing is being able to get in there, get your hands dirty with these characters, and really sort of take them apart and know what it’s like to be them, to feel like them, to know what they want and what they’re after. That’s the great thing about these particular characters. They’re so beautifully defined, even given the fact that, really, how much screen time has each of them really had? Not a whole lot, and yet you feel like you know them as well as you know members of your family. 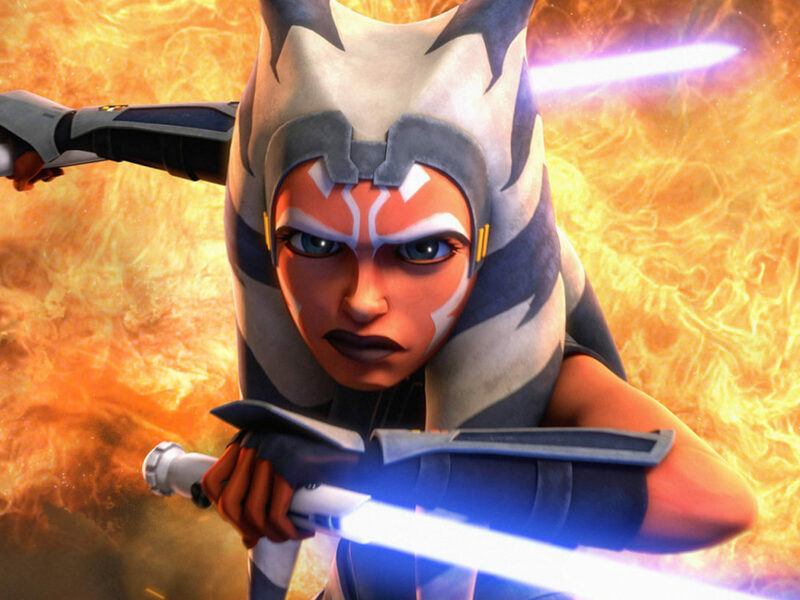 StarWars.com: So I know you can’t say much, but what can you tell us about your series? Mark Waid: Basically, the nugget of the idea I seized on is — once the Death Star is defeated, once all the adrenaline dies down, once all the medals are given out and Leia gets a chance to take a half step back — the emotional impact of losing absolutely everything you know, everything about your culture, everything about your family, all in one fell swoop. That’s something we just don’t have the time to deal with in Episode IV and V. That, I find really captivating, because that’s got to be the lowest moment in her entire life and a character is really defined by how they react in the lowest moment of their life. In this case, she has to actively choose: Will I be princess of nothing, and sort of just ride along in the Rebel Alliance and subsume myself to them, or is there a responsibility that comes with the title of Princess even though there are no subjects or royal house anymore. It doesn’t take but two minutes of screen time to pretty much demonstrate to you that Leia is clearly one of those people who was born 20 years old. You know? That she clearly had and still has a very strong sense of responsibility. It’s so obvious from everything she says and does. So, our story is about Leia not long after the end of Episode IV deciding, “Well, as the princess, there are still responsibilities that fall to me, like making contact with any stray Alderaanians out there who may not know what happened. It is my job as princess to deliver the bad news. It is my job to bring those who survived by being in other places, together. It is my job to help preserve some sort of cultural heritage of my people, so that everything my planet stood for and everything my people stood for doesn’t get forgotten.” So it’s a five-issue story [arc] that takes her across the galaxy in search of others of her kind to try and pull them together. Of course, some of them are going to be suspect, because they suspect this could be some sort of weird trap by the Empire. Some of them are going to be very angry, as they rightly or wrongly blame the house of Organa for what happened. Obviously, Leia will be traveling as low profile as she possibly can. If and when the Empire gets wind of the fact that Leia is doing is this, they’re going to be very interested themselves in what she’s doing, what she thinks she’s doing, and what information there is to be mined from these people. StarWars.com: Right from the start in A New Hope, she’s set up as a major thorn in the side of the Empire. And they know she’s alive after the destruction of the Death Star. Mark Waid: Exactly. My educated guess is that even though they know she’s alive, the last thing in the world that the Rebel Alliance needs is for her to be caught anywhere else but in the heart of the Rebel Alliance. So that will also not go down terribly well. When she decides that this is going to be her mission, there’s going to be a lot of resistance just from her own allies. StarWars.com: What’s also very cool is that you’ll get to write a version of Leia that is especially fun in terms of her relationship with Han at the time. Mark Waid: Yeah, exactly. Yes! All the relationships are up in the air at that moment. They don’t know the things we know, and that makes all the characters in their various sides of the triangle entertaining as hell to write. StarWars.com: Obviously when you’re writing characters like Superman and Daredevil and everybody else, you’re writing stories in continuity that count. But this is really the first time for Star Wars that comic book stories are going to be canonical, so it’s a pretty huge deal. How does that feel for you and what does it mean to you? Mark Waid: That’s a huge responsibility, but again, it’s an honor. I just hope that I can do these characters that we love proud. But I certainly have every intention of doing that, because it’s not about me or what I type on the page. It’s about the characters. The real fun part to me is helping give dimension to Leia. I think that she is often misunderstood as short-tempered or what have you, and I think that’s unfair. She’s direct. She’s not necessarily impatient, she’s just exasperated easily by people who are not as smart as her. She’s not bossy…well, okay, alright, she’s bossy. But she is a princess, after all, so you have to allow her a little bit of that. StarWars.com: I mean, if she can stand toe-to-toe with and talk back to Darth Vader, I think you have to cut her some slack. Mark Waid: Yeah, that’s just it. That’s the thing. Find me somebody else in that movie who stood toe-to-toe with him and mouthed off and lived to tell the tale.